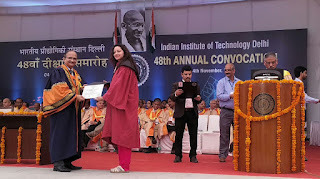 Dr. Subi Chaturvedi received her PhD. 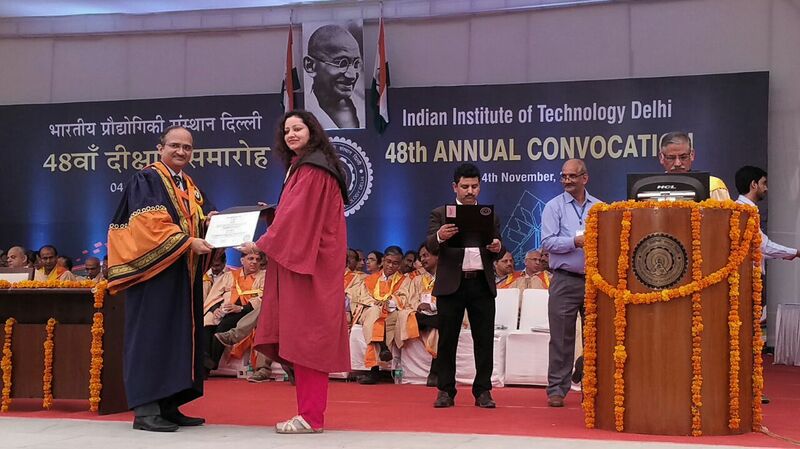 from IIT-D today at the convocation presided by the Hon. President of India Shri Ram Nath Kovind and Kumar Mangalam Birla, Chairman of the IIT Delhi Board and the Aditya Birla Group. Ms. Chaturvedi’s work at IIT is considered path breaking and seen as a significant step forward towards examining New Media technology, Social Media, Political Communication, E-Governance, News Gathering, Deepening Democracy and their impact of both inclusive democracy, enhancing citizen participation, and the discipline and practice of both management & communication as well. This is the first primary study in India with senior editors and journalists, and their use of social media in the field of political communication and technology. It has staggering findings and detailed case studies on key ministries of the government including MEA and Railways. It proposes a unique model for the media and the government for technology adoption and enables the creation of a 24X7 responsive government for truly actualising the power of over a billion mobile connections and 350 million internet users. The study is particularly significant for developing countries and emerging economies where access, connectivity, digital literacy and capacity building remain critical issues. The first of its kind study done by Dr. Subi Chaturvedi during her PhD. at IITD is significant for political parties and the government as they go into election mode. The technology model proposed examining the motivation of influencers online will enable better mapping and structured channels of engagement for focused and precise delivery of key messages. Lead to better Campaign management as well. Where over 180 constituencies are expected to be impacted directly with social media, this can be a game changer for general elections 2019. Twitter and social media have emerged as essential tools of the cyber arsenal for most parties and give an instant connect and real-time feedback. There are lessons in the study for the discipline of management, as well as information and communication flows, as traditional institutions of socialisation get subverted and the top down model gets increasing replaced with many to many forms of communication, which are loosely structured, decentralising power and democratising the public sphere. For brands and the corporate world these insights mapping the online time spent, the social media preference, the detailed analysis of Twitter adoption in India for breaking news will be invaluable for brand building, management and recall. Complex issues of internet Governance and facilitative policies for citizen empowerment are also explored. What ultimately makes or breaks news, how agendas are set, framing, priming and agenda setting takes place and ultimately how social media, in particular Twitter is being used for breaking and making news. These mediums also allow new heroes to be discovered and amplifies multiplicity of views and opinions, plurality of voices and can help create the next generation of political whiz kids breaking barriers and effectively challenging dynastic legacies. The art and craft of political communication due to rock bottom data prices and new and emerging tools of communication can now be honed to a science with the intersection of liberal arts, interdisciplinary research such as this, and big data analytics, classifying both consumer and citizen preferences and causes to their last mile. Multiplying tremendously the chances of conversion of both consumers and citizens into products and votes. The study is a reservoir for further research and holds tremendous scope for scalability and further exploration by technology researchers as well as Humanities and political science scholars. Mr. Birla Birla also alluded to both technology and disruption as the key for the new revolution. A positive correlation is found between perceived usefulness/ease of use of social networking sites and journalists’ attitude to following political news, between attitude to follow political news and journalists’ behavioural intention towards accepting political news online, between the attitude to follow social networking websites and journalists’ actual use of the site towards accepting political news online; and between intention to follow social networking websites and journalists’ actual use of political news. The correlation between consonance of external factors of social networking websites with the adopter’s values and journalists’ attitude to follow political news was not found. The dependency and usefulness of Twitter highlights the importance and potential of social networking sites in agenda setting and news gathering. This research paves the way for, and warrants further research into the importance of other social networking sites in accessing and distributing news. Dr. Subi Chaturvedi is a former member of the United Nations Internet Governance Forum MAG in which capacity she advised the UN Secretary General on global Internet Governance policy matters. She is currently the Head and Sr. Director of Public Affairs, COAI. A widely published, public policy professional and noted columnist, activist academician and scholar, she writes regularly on Cybersecurity & emerging issues, Digital Diplomacy, Internet, Governance, Youth, Media, Technology, Policy, Political Communication, and Digital Economy and holds a PhD from IIT- Delhi.